It's been a little silent around here lately - I'll explain why very soon! In the meantime, I’m launching a new section here on Chocolate Shavings: Jenn's Favourite Kitchen Things! As well as having a never-ending passion for everything culinary, I’ve always had a particular interest for how we decide to decorate our tables and display our food. This summer, yellow is my color of choice! 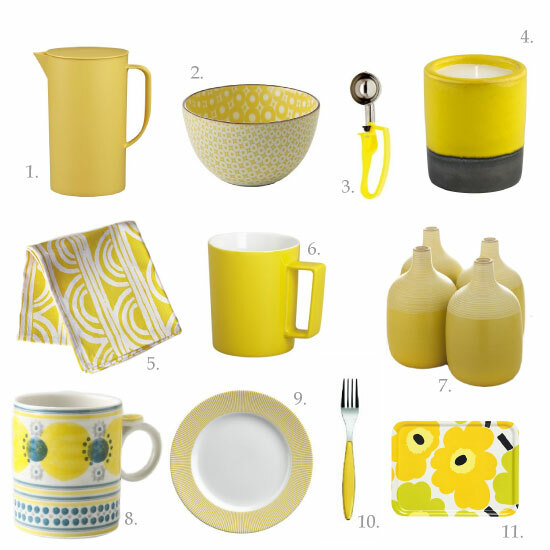 Here are some of my favourite items to add a bright, crisp, colourful splash of yellow to your dining table. Modernist Bowl I want. I love yellow! I need to get me some of those bowls! Thanks for sharing these great ideas. Love the vases. Very pretty. Very cute stuff! I also love yellow. Used to be my favorite color, until I discovered peach :-). Cooking Rookie: I'm glad you're enjoying the book! I love yellow things in the kitchen. I've long dreamed of having a pale yellow kitchen with lots of sunshine (and lots of space). Until then, these are all beautiful. Love all your yellow as it's very bright and sunny. My kitchen is red now, it used to be yellow and this makes me miss it. I'm new here and like your blog. I'll follow and look forward to more great posts! Are the measures in the recipes British or American? I need to know in order to convert them into Swedish measures. Great blog, great inspiration. Thank you! Anonymous: Which recipe are you refering to? The measures are American measures for the large marjority!